The Australian Jockey Club was founded in 1828. They operated a race-course at Homebush on the Wentworth Estate (the main Olympic Site) from 1841-1859 before moving to Randwick in 1860. The main transport for Sydney punters were the Parramatta River Ferries. After 1859 and until the 1870s the course was used as a training track, for stud work and for spelling horses. Australia has the distinction, with Greece, of being one of two countries who have had a representative at all of the modern Olympic Games. In the first twenty years of the Olympic movement there was talk of an Olympic Games in Australia but distance and lack of support here defeated the idea. A successful Olympic Games was held in Melbourne in 1956. In 1977 New South Wales considered making a bid for the 1988 Olympic Games but withdrew giving the excuse that it would cost too much. The plans included venues at Homebush Bay which was possible because the large areas of land becoming available because the State Abattoirs and the State Brick Works were closing. In the "Homebush Bay Development Strategy" by the Homebush Bay Development Committee dated 30 June, 1989 are the outline of all the major components of the recent changes, including the relocation of the Royal Agricultural Society Show ground from Moore Park. SOCOG (Sydney Organising Committee for the Olympic Games) was formed in 1991 with the backing of the Australian Olympic Committee, N.S.W. State government politicians from the major political parties (non-partisan) and business organisations. From 1992 the bookmakers had made Sydney the favourite from amongst the competing cities. As September 1993 came closer the newspapers were full of "Olympic Bid" news. There were some who said that the state would be bankrupted but most Sydneysiders were excited and learnt more and more about manoeuvring in the IOC (International Olympic Committee). There are at least three legends about the winning bid, of which only one is true. It is said that an eleven year old Tanya Blencowe won the bid for us. She wasn't the only one to put in a lot of effort however it was a cleaver move of SOCOG to include her in the presentation to the IOC. Letters are still written to the papers claiming that Juan Antonio Samaranch, the IOC President said: "The winner is Syd-en-ney" or "The winner is Syd-ney" even though the evidence is on video-tape for the second and correct version. At Monte Carlo John Fahey, the then New South Wales Premier, leapt high with joy when the announcement was made. Meanwhile, this was Friday, September 24, 1993 at 4:27am Sydney time, thousands of Sydneysiders were waiting at Circular Quay, Sydney. The parties there and elsewhere went on through the day and into the Saturday morning. Eventually the people came down from the heavens and the hard work began. So far the timetable of preparing the venues and housing for athletes, officials and press are on track. Most people are happy with the way things are going but some lovers of the environment are disappointed that the "green games" will not be as green as we had planned. However it took a while for the environmental studies to show how careless were the governments and industry of earlier time in dumping waste. November 1892, Area of 15 acres 1 rood 30 perches set aside at Rookwood (Lidcombe) for recreation, variously Lidcombe Show Ground or Rookwood Park. In April 1898, Auburn Council became trustees of Auburn Park. 10th August 1926 official announcement of acquisition of land for Wyatt Park. The Grandstand at Wyatt Park (Lidcombe Oval) was completed 1932-3 for the developing Soccer Competition. Later in the decade cycle racers were held there. The Auburn Botanic Gardens were opened on 11 September 1977, on land set aside by the Cumberland Planning Scheme. Bicentennial Park was largely completed by June 1987. The Millennium Park is still to be completed at Homebush. There are smaller parks in the district. The Auburn Town Hall was opened in 1898 and there is evidence in play-bills and copies of newspaper reviews of musical and theatrical performances in the years following its opening. Articles in the "Cumberland Argus" indicate visiting musical groups performing in Church Halls at Rookwood (Lidcombe) during the 1870s. December 1908 brought the opening of the Auburn School of Arts in Queen Street. Between 1961 and 1979 it was occupied by the Auburn Municipal Library. 13 January 1911 Earliest cinema at Auburn -- 24 August 1912 Arcadia cinema, Joseph Street Lidcombe. - 21 November 1913 Queens Theatre in Queen St Auburn - 1924 New Arcadia cinema opened in Bridge St. Lidcombe. 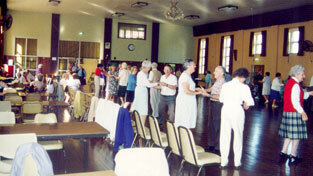 For many years, Mrs Jago organised daytime Ball Room in the Auburn Town Hall - This was 1996. One of the earliest swimming pools, not on a river, harbour or seaside, was opened as Hampden Baths in Church Street, Rookwood (Lidcombe) in 1899. The Sydney Water Board at first gave them a free allowance of water. Auburn Council opened the Silverwater Baths, a tidal pool, on Parramatta River on 16 March 1929. It did not survive beyond the beginning of World War II. Hampden Baths also closed about that time. The Auburn Swimming Centre was opened in Wyatt Park 17 October 1959. However memoirs of growing up in the area often swimming in any free body of water. This sometimes led to tragedy. The dam at the Sydney Meat Preserving Works cannot have been too clean but people mention even this with pleasure. In 1809 Thomas Bates and Samuel Haslem were granted pub licenses on Parramatta Road for the weary traveller. Railway Hotel, Rookwood, Bernard Gormley first Licencee, 1876; The Royal Oak, Rookwood, S Gazzard first licencee c1878. There are reports of cricket matches between teams from Haslems Creek (Lidcombe) and Parramatta in the Cumberland Argus during the 1870s. Since then there has been a continuous cricket tradition, for example the Auburn-Lidcombe Cricket Association celebrated their 75th Season 1996/97. There are a number of Junior Soccer Clubs still active. In the 1930s and 1940s Lidcombe Oval was a venue for Cycling Competitions. The Carnarvon Golf Course has had two locations at Silverwater and Lidcombe. The Auburn Golf Course is on the Banks of Duck River.